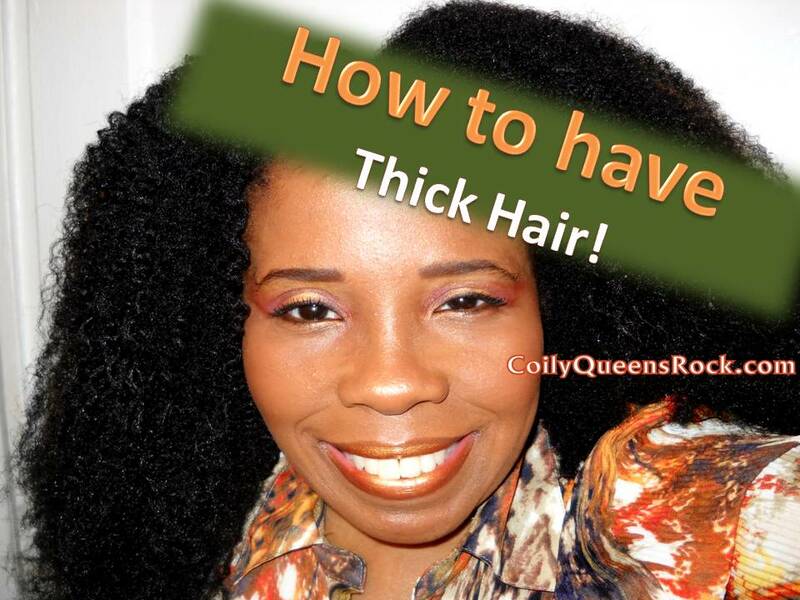 CoilyQueens™ : Help, I want thick hair! Help, I want thick hair! Narrow follicles produce thin hair. Large follicles produce thick hair. Hair thickness is determined by the number of hair follicles your have and the diameter of each hair strand. These factors will determine your hair thickness. The number of hair follicles on your head are determined in the womb. The diameter of your hair follicles are also determined in the womb. As we age some people will lose hair follicles by closing up, however you will never gain new hair follicles. Your hair strands can become thinner as you age and from damage. Hair vitamins nor tropical products do not increase the width of your hair strands. Well what can I do to make my hair thicker? There are many products on the market, that when used correctly, makes your hair appear thicker. The products you see which say, fuller, thicker hair, contain ingredients that stick to the hair strands. These ingredients stick to the hair strands and temporarily make your hair strands look fuller. When you shop look for key words such as: fuller hair, volumnizer, volumnizing, thickening, and variations of these terms. Be conscious that many times these ingredients can stop moisture from getting into your hair strands, so only use these types of products on healthy hydrated hair. Ingredients which stick to the outside of your hair strands. Hydrolyed proteins stick to the hair strands and fills in broken spaces along the hair strands. The protein temporarily makes the hair stronger. Because the protein is reinforcing the hair strands, it also will make your hair look fuller. Henna coats the outside of the hair strands and this adds color to the hair. Because it is adding something to the hair, it also makes your hair look thicker. That effect is permanent. You will read lots of women testify that castor oil made their hair thicker. Any thick oil such as castor oil, when applied day after day, will coat the strands and make the hair appear thicker. This is temporary. Once you wash the oil off your hair will return to its natural thickness. Good products to help you have thicker, fuller looking hair! Help my hair is shedding!